I used to have a habit of routinely baking different batches of muffins, keeping the freezer well supplied for portion-controlled on-the-go snacking. 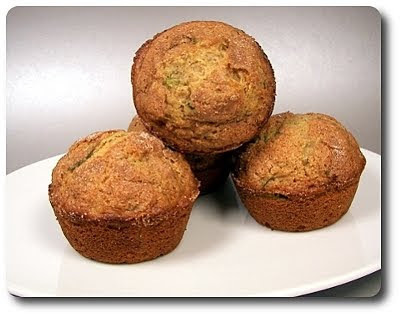 Muffins tend to freeze quite well and thaw in a hurry and if you want to refresh them to an almost just-baked state, a quick stint in a toaster oven does the trick. Jeff made a passing comment last week that it had been some time since he's been able to pull any from the freezer, which got me in gear to get a pan in the oven. I would normally gravitate to chocolate or one with a groovy, butter-laced steusel on top, but we've had our fair share of those heavier treats over the holidays. 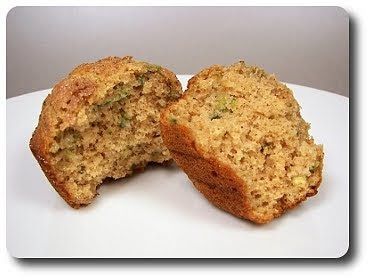 With that in mind, we tried these Zucchini Muffins since we still had some shredded zucchini bagged in the freezer from ones we were gifted early last fall. Flavoring these muffins is a solid dose of cinnamon, which was more intense for us as I used my favorite Vietnamese cinnamon. I know I mention that fairly often, but I've tried different varieties in the past (Ceylon and Korintje) and I've never been as satisfied as the full bouquet the Vietnamese has to offer. The main sweetness in these muffins come from granulated sugar (coming in at just over a half tablespoon per muffin), but a couple tablespoons of golden honey are added, which I found brings a delicate bonus kiss of sweetness. Since they take don't take long to bake, I was able to get the batter in the muffin tin, baked and ready to snack on in less than half an hour. If you wanted to make these for a breakfast treat, you could even speed up the process by combining the dry and wet ingredients separately the night before (storing the wet in the refrigerator). Then, when you get up in the morning, just combine the two together with a few short strokes of a wooden spoon and it's ready to go (and you're less likely to forget an ingredient being groggy!) . For a little extra oomph, before the muffins were baked, we sprinkled each batter-filled well with a speckled concoction of sugar and a heavy pinch of cinnamon. These bake until the centers rise up to form a beautiful crown - you can either lightly press on their tops to see if they spring back for doneness or stick a toothpick inside to make sure the batter has cooked through. 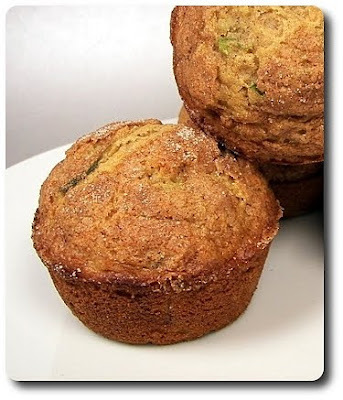 We quite liked how the strands of zucchini remained fairly visible, but their essence seemed to dissolve into the muffin, leaving you with a moist inside that doesn't make them taste like the garden. If you like more texture inside your muffins, a handful of crunchy toasted nuts (I would use walnuts or pecans here) or chewy golden raisins would make excellent mix-ins. You may not have the lighter pastry flour called for (which we usually find in bulk bins at our markets) - you could use white whole-wheat flour (which still may be hard to find) or certainly regular whole-wheat flour, but the muffins may end up with a slightly denser crumb. I know it seems like we just did an egg-y pizza, but I just had to try out this Jalapeño, Sausage and Egg Breakfast Braid when I came across it in a recent magazine. 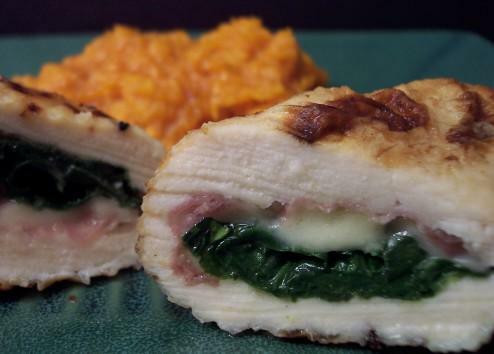 It's a pretty lengthy title, even though I shortened it slightly with some nominal changes to the ingredients, but it certainly lets you know what's all inside this wrapped package! It originally called for a can of pizza dough, but when you can whip up a whole-wheat version in a snap like we do with our homemade dough, why not go that route? I did go with the pound version this time, just to ensure we would have plenty of dough to work with. Once it had been buzzed through the food processor and given a chance to rest, we scooted the dough onto a parchment-lined baking sheet and gave it a few quick stretches to create a large rectangle. Working with the dough first, rather than getting the filling ingredients prepared, gave it a few minutes to relax and begin to puff slightly, making for a blank slate that's a dream to work with. Just be sure to cover the rectangle with plastic wrap to prevent the dough from drying out. To stuff this braided loaf, our attention was then tuned to chopping up an onion and a quarter-pound link of lean chicken sausage (the kind that's cooked, not raw). Use your favorite flavored link - we went with an andouille version that had a peppery, smoky bite. Because Jeff isn't the biggest fan of any raw pepper, I did throw in the seeded jalapeñoes at this point, but if you'd like to make this and that is not a concern, hold them back for now. When the chunky sausage cubes had browned, it was time to stir in the eggs - however, since I bulked up the amount of pizza dough slightly, I figured it could stand more filling. There were to be two large eggs scrambled, but I whisked in a couple extra egg whites that I had sitting in the refrigerator (they were going into breakfast tomorrow morning... but I'm sure we'll manage!). Just like in that other pizza, keep the curds on the loose side as they will get more action in the oven. To get all of the filling ingredients neatly on the dough and help give you a clean braid, imagine a skinny rectangle smack dab in the middle when you start to assemble - I used the back of the knife to lightly draw a box right onto the dough using the dimensions listed. Inside the box I drew went a shredded bed of Monterey Jack, followed by the lightly cooled scrambled egg mixture and another cheesy dose in the form of sharp white cheddar. If you do decide on using raw jalapeñoes as mentioned above, adorn the tiny pieces on top of the cheddar now instead of adding them earlier. The process of branding the dough is actually much easier than you might expect, as all you are doing is cutting strips on both sides, just short of the filling, then pulling them over to the other side (not a "true" braid per se). A pizza wheel works well to cut the strips, but a pair of kitchen scissors or even a knife would do the trick. Once the braid is complete, the loaf is brushed with a beaten egg white and baked until the outside takes on a glorious golden hue and the cheese inside has melted. I have to say I loved how well this sliced - everything was contained and nothing fell out even after being cut and allow to sit for a few minutes. The sausage and egg was a dynamic combo, especially with the gooey jack and cheddar, while the peppers injected just enough heat to keep our taste buds hopping. Don't take that to mean this was really spicy - it was more of a controlled, mellow heat that wasn't too much if you were serving this in the morning. However, being controlled, one could easily amp up the heat by leaving a few seeds in the peppers or dosing the eggs with a few flakes of crushed red pepper. Last Tuesday, I thought about stashing the few unused chicken thighs that we were left after making that Chipotle Chicken and Rice in the freezer. 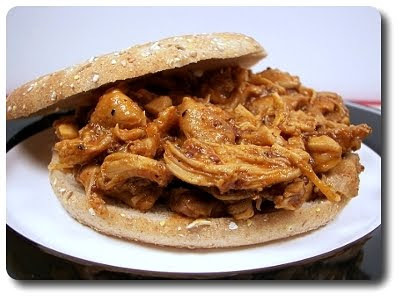 I asked Jeff if he wouldn't mind another chicken dish that evening and he agreed, especially after hearing the title of what we would be making last - Black Pepper and Molasses Pulled Chicken Sandwiches! If you've never made your own barbecue sauce, you'll soon see how quick and effortless it can be. Getting us started were a few squirts from our handy bottle of ketchup, followed up with tangy cider vinegar, mustard, a drizzle of robust molasses, chili powder, cumin and a touch of ginger for zing. Don't be a slave to the type of mustard we used - your favorite prepared mustard is fine, but since we always keep a jar of grainy Dijon in the refrigerator, that's what went into our mix. Stirred to combine, we dropped the chicken thighs right in, sliced into cubes first, then brought the dark sauce to a rapid bubble. Because of the sugar in the sauce, you don't want to keep the heat too high - once it boils, step down the heat, cover the pot to trap in the moisture and let the chicken gently cook in the sauce until it is fork-tender. When it gets to that point, all you'll need to do is take a couple forks and pull the chicken cubes apart right in the sauce, shredding the meat. If you worry about using forks in your pan, pull the chicken out first - add the shreds back into the sauce and reheat gently. The recipe suggested a serving of four, but we barely nudged out three decent saucy servings (well not even that anymore as *someone* went back and had a few nibbles). You may want to think about doubling the recipe for fuller portions or if you would like leftovers. Since I didn't get a chance to refill our bun supply with those homemade burger buns we like so much, Jeff picked up these fiber-rich sandwich thins at the market. They were actually quite good, but didn't hold up the best to the sweet sauce... I don't think they'll be replacing those delicious buns anytime soon! For this week's Wednesday Treat Day, we delved into one of the holiday magazines and picked out a cookie I had planned on making over Christmas, but time got away from us and it was put on the back burner. I have quite a few still marked off that looked interesting and hope to work through them over the next few months! 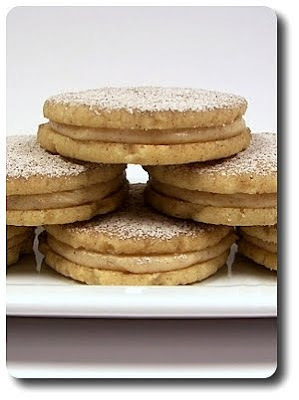 To get these Chai Shortbread Cookies going, it required taking a basic batch of shortbread dough and adding a variety of spices to burrow in flavors reminiscent of the tea. We used a combination of cardamom, cinnamon, cloves and a pinch of finely ground black pepper to flavor the dough, which was made simply of good-quality butter, confectioners' sugar and flour. Note we used unsalted butter as we typically do - if you use salted butter, take out at least 1/2 teaspoon of the salt called for. To speed the process of getting the cookies into the oven, rather than rolling the dough into a log and refrigerating it to slice off rounds, we rolled the dough into balls and flattened them with the bottom of a glass. 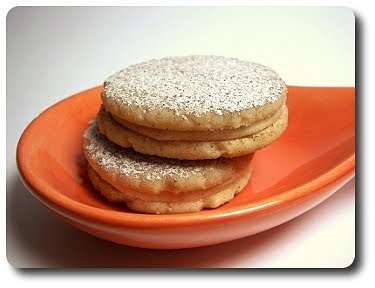 Dipping the glass in granulated sugar in between flattening will not only add a little crunch to the tops of the cookies, but will help them release and not stick to the glass. To keep these cookies tender, bake them only until the tops are set and the edges are a light golden - they are fairly fragile right out of the oven, but leaving them on the baking sheet for a minute or two will help them firm up enough to transfer to a wire rack. While the cookies were off cooling (with a little doggy near-by waiting for any crumbs to fall! ), we whipped together a mixture of half-and-half, instant espresso powder, confectioners' sugar, butter, cardamom, cinnamon and ginger to create a creamy, spiced buttercream. If you don't have espresso powder, instant coffee powder would be okay - since it is not as powerful, use double the amount called for. If you're worried about using it because you don't like coffee, it doesn't come across as "bam! I'm all you can taste". What it does add is a slightly bitter depth, which helps cut through the sweetness and round out the spices. You can measure the filling out with a teaspoon to scoop on half of the cookies, but if you don't have the patience for that, drop the filling into a pastry bag (a zip-loc bag works well too!) and squeeze away! Once topped with the crisp un-filled cookies, creating a dainty sweet sandwich, we added some interest on top by sifting over a mixture of confectioners' sugar and cocoa powder. The cookies by themselves are mildly spiced and when I first tasted one by itself, I felt a little underwhelmed, though the melt-in-your-mouth texture was spot on. When paired with the dosed filling and another cookie however, the marriage was a blissful combination and my expectations were fulfilled! We prepared a dinner recently that was pretty much hands off, leaving the oven to do most of the work. Well, there was a little prep work before hand, but this Chicken, Lemon and Dill with Orzo dish would be great for those nights where you need to get dinner on the table, but can't afford the extra time to tend to it. Mixed in the same baking vessel the meal was going to cook in, a combination of chunky chicken breasts (no, they are not cooked first!) 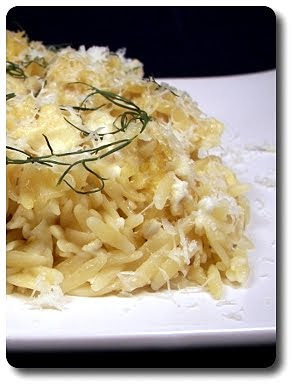 and dry, uncooked orzo (rice-shaped pasta) was tossed with copious amounts of crumbled feta, dill, fresh lemon juice and zest. Liquid is needed to bring those ingredients together and give the pasta a zesty pool to absorb, but instead of just using water, a seasoned union of chicken broth, water and a pat of butter was added. However, to give the dish a jump start, the mixture was brought to a rapid bubble first, then stirred into the dish. All that was needed was to then pop the casserole into the oven (you don't even need to cover it) and leave it be until the chicken had a chance to cook through and the pasta became tender. I wondered if the pasta would become a mushy mess as it took about forty minutes to bake, but we found that was simply not the case! The orzo plumped up nicely, taking in most of the cooking liquid, but it also left some behind that ended up becoming a creamy "sauce" that kept the casserole moist. As soon as it was ready, the dish was taken out from the oven and sprinkled with a smattering of fresh grated Parmesan cheese, letting the residual heat melt the nutty shreds. Serving six hearty portions, I was anxious to dig my fork in and see just how those ingredients married together. Jeff and I were initially concerned that the amount of crumbled feta might come across a bit too strong in the finished result, but as it melted into the dish, it seemed to settle into a delightfully salty groove with a subtle tangy bite. We loved how the use of lemon turned into a brilliant shot of lightness that cut through the richness of the cheese and pasta. The leftovers reheat well the next day, though the pasta was a bit softer - neither of us minded though! I'm betting this would make a solid vegetarian baked pasta dish too, leaving the chicken meat out and swapping the chicken broth for vegetable. When Jeff was off from work over the holidays, I asked if he wanted me to make anything specific before I started pulling out recipe ideas. He jumped quickly with a response of "rye bread and homemade pretzels please!". Of course he also asked for the obligatory sweets, but those were all repeat recipes (he had his fill of Gingerbread Popcorn and Cinnamon Fudge!). 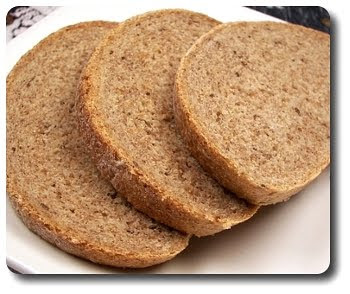 I obliged with the breads and we're here today to talk about the Home-Style Caraway Rye Bread first. You'll need stone-ground rye flour for this bread, which I was able to pick up at the bulk bins of a local natural foods co-op - I have also seen it boxed in the regular market. 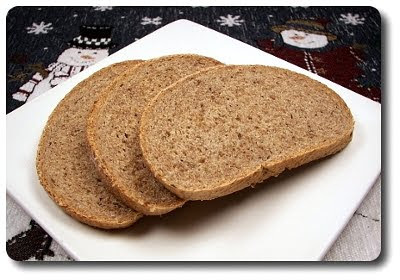 Do note the timing for the complete recipe - the day before you want to make the bread, you'll need to start with a quick 24 hour starter, made by stirring together rye flour with warm water and a tiny amount of yeast. If you prepare the starter in a clear bowl, you can watch it rise and become fairly bubbly as it sits for a day - it'll also create a strong, yeast-y aroma, so don't take too big of a whiff when you take the covering off (which Jeff did and promptly walked away from the bowl, coughing... hee hee!). Into that gooey mixture, we added a bit more yeast and a cup of warm water. I use instant yeast, which allows me to add it right into the dry ingredients and skip the blooming step. However, if you only have active-dry, go ahead and for this part, add the yeast into the water and let set for about 10 minutes first. When we began to add flour to the starter mixture, we cut the rye flour with strong bread flour to strengthen the dough as rye flour alone doesn't have a lot of gluten to it. 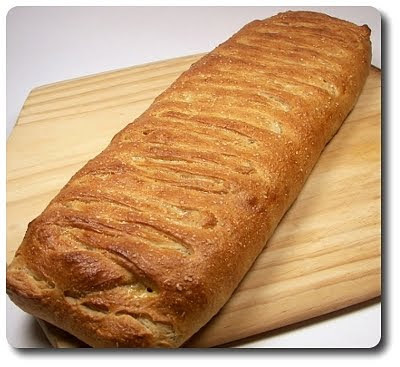 This way you won't end up with a brick for a loaf. Instead of dumping in all of the flour at once, the rye flour goes in, but we added just enough bread flour to make a dough that is sticky, but still manageable. We worked almost all of the remaining in while we were kneading, but not all of it. Since humidity plays a role in exactly how much you need, holding back keeps you in control - you want to end up with a dough that is firm, smooth and not sticky, but a little tackiness is good. When the dough had risen about doubled in size, we shaped the squishy mass into a torpedo-shaped loaf (don't forget to pinch the seam and ends firmly to close!) and scooted it over onto our pizza peel, which we dusted with cornmeal so it wouldn't become one with the peel. If you don't have a peel, a baking sheet works too - whatever you can use to slide the dough onto the stone. Parchment paper would work as well if you'd rather not deal with cornmeal. Left to rise once more, before we set the loaf into the oven, we dusted the top with rye flour and used a sharp knife to slice a few gashes on top. This, along with spraying the oven walls with water as you put the loaf in, is supposed to give you the best oven spring and allow the loaf to expand without tearing. Once in the oven, the bread is done when it looks golden and if you were to tap the bottom, the loaf would sound hollow - if you want to be completely sure, the bread should have an internal temperature of about 200 degrees. Jeff was anxious to try it, but I made him wait (suffer, he would say) until it had pretty much cooled completely. Mean, I know, but the texture always seems better and it makes slicing easier when it has cooled down. With specs of caraway seeds strewn throughout the entire loaf, Jeff was quite pleased with the crumb and just how flavorful and intense this rye bread was. Even with the bread flour though, I do think the loaf leaned to the denser side - but I think that's to be expected with this rustic homemade rye. This week's Friday Night Pizza didn't come out shaped quite as intended, but thankfully that didn't interfere with just how tasty they ended up! 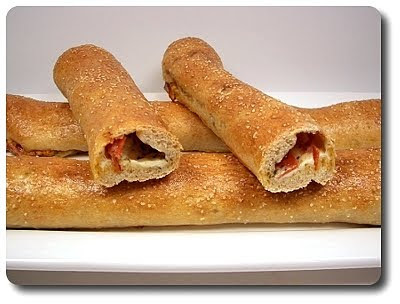 These ridiculously easy Stuffed Pizza Sticks were actually supposed to be turned into pretzels, but they ended up being stuffed so full (a good thing!) that shaping them in one piece wasn't going to fly. Working with the pound version of our whole-wheat pizza dough (yeah, I'm sure you guessed that already! 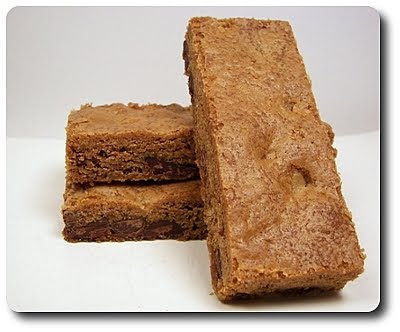 ), I divvied the hunk of dough into four pieces, then stretched each out into a rough rectangle. I didn't measure the actual size, but if I have to guess, it probably ended up being about 4 or 5 inches wide by 8 or 9 inches long. On top of the rectangles, we scattered a mess of shredded mozzarella, seasoned each with a bit of dried basil, then added ample amounts of chopped pepperoni. I did opt for turkey pepperoni, mainly because we like that it isn't nearly as greasy, but use regular if you like. 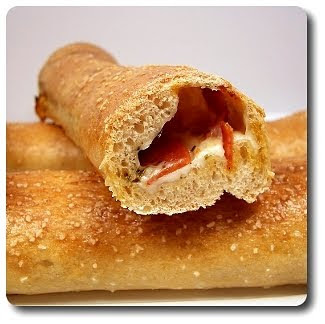 To keep all those ingredients inside of the sticks, fold the short ends in (kind of like when you roll up a burrito), then roll up the dough jelly-roll style and use your fingers to tightly pinch the seam together. 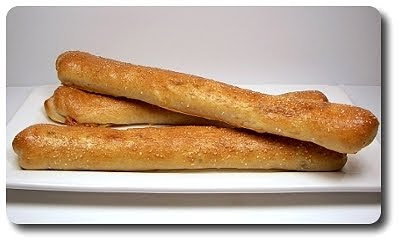 Rather than tossing them onto a heated stone, which we normally like to do with pizzas, the sticks went onto a baking sheet, where we brushed each with beaten egg to give the dough a rich golden color. Even without the shape, we wanted to keep with the pretzel theme, so just before they went into the oven, we sprinkled the top with a bit of coarse salt. You can vary the filling as you like, using different cheeses, herbs and whatnot (a spinach, feta and garlic combo sounded good to us!)... just try not to go too crazy with the amounts or the sticks are likely to bust open. I had mine as is, but I warmed up a bowl of a garlicky marinara sauce we had in the freezer as Jeff requested such to use as a dipper. I think I'll to that too when we warm up the rest for lunch tomorrow! I had ideas for the head of broccoli I bought this weekend, but apparently they never came to fruition and I had to figure out what to do with it or in the compost it went. 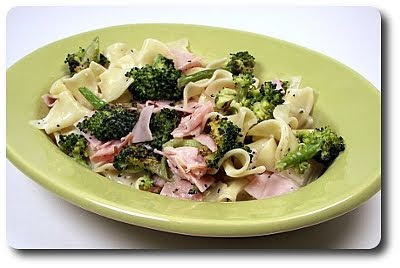 I originally had a repeat pasta dish on the menu for tonight, but since I didn't want to waste the broccoli, I sifted through our to-try pile and found this no-fuss Creamy Pasta with Ham and Broccoli dish to make instead. To add a robustness to the broccoli and bring the green vegetable back to life, instead of steaming or blanching, we tossed the florets with olive oil, salt and fresh ground black pepper, then slid them onto a sheet pan and into the oven to roast. While we waited for the intense heat of the oven to turn the stiff, raw broccoli into tender and lightly browned florets, we dunked a few ounces worth of wavy egg noodles into a pot of boiling, salted water. Before we drained away the now-starchy water, we set aside a couple cups worth to help create the sauce. Rather than dirty up another pot, we used the same one we cooked the pasta to prepare the sauce, which is simply two ingredients - softened cream cheese and a portion of the reserved cooking water! When adding both of those into the pot, keep the heat on medium-low as you don't want this to come to a boil - just enough heat to melt the delicate cheese. 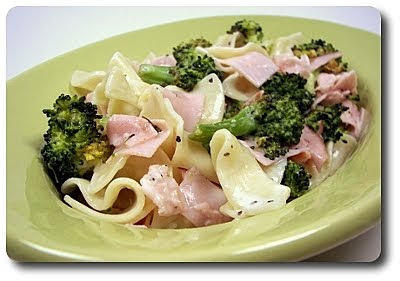 When the sauce was smooth and ready, the roasted broccoli went in, along with ribbons of thinly sliced ham to make this dish a bit more complete and filling. When the noodles are folded in (be gently here so the broccoli stays intact), you'll have the option to play with the texture of the sauce - as is, it comes across as being fairly thick. However, you should still have another cup of the cooking liquid to add if you would like to thin it out. This method using cream cheese gives you a sauce that is silky, just rich enough and as long as you season it well with salt and fresh ground black pepper, is not nearly as bland as one might think. I figured we were going to need a shower of Parmesan or Asiago to not end up with a boring plate of pasta, but surprisingly enough to me, neither of us felt the urge to reach for either of them. You could even go a bit more extravagant and trade the cream cheese for hefty dollops of mascarpone cheese. When I asked Jeff on Saturday what sounded good for this week's Wednesday Treat Day, he said he's really had a craving for your basic, everyday chocolate chip cookie (because you know it's all about him anyway... right? I'm sure his co-workers would tell you the same thing!). But actually, that sounded darn good since it had been awhile since we've done that. Instead of doing them in individual drop form though, I thought we'd try these Bittersweet Chocolate Chip Cookie Bars. Whipping a mass of butter (I know you clutch your heart when you look at the amount... but hang on, wait until you see the pan size!) with a pair of sugars until the fusion had become smooth, luscious and spoon-worthy got us running right out of the gate. 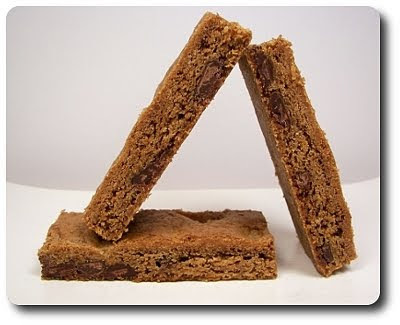 You can play around with the balance of sugar if you like, but I went with a heavier amount of brown sugar to granulated because we were looking for bars that had a hearty, dense chew to them. Sloshing in a couple eggs and an honorable splash of vanilla brought the wet ingredients together, making the mixture ready to swallow the dry ingredients. When the flour mixture went in, stiffening the dough, the star element was stirred in - bittersweet chocolate! Because I wanted plenty of chocolate nuggets to go around, I tossed in just shy of a pound, using a mixture of chips I had in the pantry and chunks taken from an excellent bar we were given over the holidays (which was an effortless process using that Chocolate Chipper my sister got us!). Using a large half sheet pan (it must have sides), the chocolate-studded dough was spread over the bottom and baked until the giant cookie was richly browned around the sides, lightly golden in the center and the top was set. Cut them into more modest squares if you like, but to get the full, lavish experience, I cut them in thirds down the middle, then sliced the two rectangles into pudgy fingers. If you wanted to serve this for a party, you could also leave it whole and decorate the top with your favorite frosting, just like they do in those mall shops. 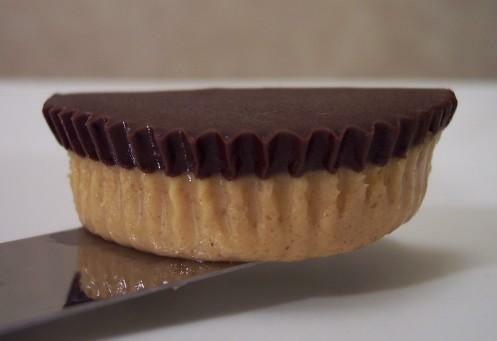 Jeff already has devious plans for the next batch we make by dividing the dough into two portions, adding M&Ms to one and chopped pieces of those miniature Reese's peanut butter cups to the other. Whatever you decide to do, it's hard to go wrong with a big, hunky slab of baked cookies! We've been making a lot of one-pot dishes lately and I'm diggin' this less pots and pans to wash stuff. 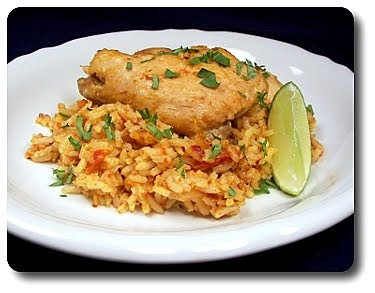 Continuing with that theme, I made another tonight, Chipotle Chicken and Rice, that we think will stay near the top of list of recipes to repeat (which I'm sure doesn't get tapped nearly as often as Jeff would like!). We gave a range on the meaty chicken thighs called for - I used about a pound and a half to attain four hearty servings for us, but the original did call for two full pounds. Both of us thought our amount was plenty, but if you'll be serving meat-hungry people, bump it up to two pounds. While the chicken does cook through as apart of the rice-cooking process, to give it a more developed character, after the thighs were seasoned, we browned both sides of the chicken (in two batches - don't try to stuff all of them in the pot and expect to get a decent sear) first, then set them on a plate while we continued on with the recipe. Into the drippings left behind, we tossed in a mild sliced red onion and let the pieces sweat out, scraping the bottom of the pot as we went along to pull up any tasty bits stuck from the chicken. If the bottom of your pot looks a bit dry or the bits don't seem to be coming off, don't be shy to use some help - add just a little wine, broth or even water, to help loosen the prized caramelized nuggets stuck to the bottom. Garlic, chopped coarse, went in next, along with cumin and the magic ingredient for this one-pot meal - chopped chipotle chiles! These gems are just smoked jalapeños, canned in a vinegary sauce, that are earthy and lend a fiery sweet heat. Since we crave spice, we used two - but one would be fine, or if that is even too much, you can scrape the seeds out to lessen the blow. Once the garlic and spices had a chance to bloom, a couple fresh tomatoes are tossed in and allowed to cook until their juices flow over the bottom of the pan, giving you a base to cook the rice in. You won't have quite enough liquid, so a cup of broth (or water, if you so choose) is also poured into the pot, along with the partially-cooked chicken and any juices they left behind. The rice doesn't go in just yet - a cover is added, trapping the moisture in the pot, and the ingredients are left to simmer and marry. Several minutes later, the rice is ready to go in, basmati in our case (or your choice of long-grained white rice) - I do suggest removing the chicken first as you want the rice to be completely submerged in the liquid. However, be sure you put the chicken back in! Do note that this takes longer to cook than your average pot of rice - plan for an extra 5 to 10 minutes. 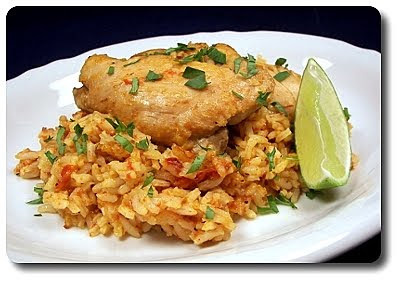 Cooked until the rice absorbed all the fragrant juices and liquid in the pot, turning a rosy tinge of red in the process, we served each portion with a sprinkling of cilantro and a wedge of lime for a touch of brightness. I appreciated how the layers of salt seasoned this dish, first on the chicken, a little with the onion and finally with the tomatoes as each had their own benefit and resulted in a meal that was anything but bland! I usually try to bake Saturday mornings so we have a sweet good to talk about on the weekend, but we had a bunch of errands to run since we were gone most of the week and I just couldn't carve out time today. We do, however, have a savory dish we made a couple weeks ago that I need to talk about! Have some pent up aggression you need to work out and also have to get dinner on the table in a flash? 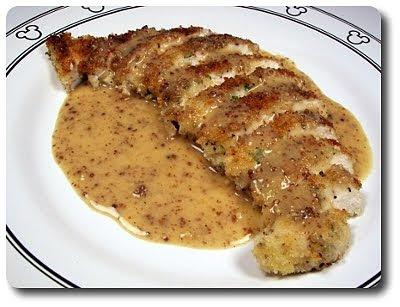 Then I implore you to think about about making this elegant Panko-Crusted Chicken with Mustard-Maple Pan Sauce! To make sure the chicken cooks quickly, and more important, evenly, you'll want to flatten the chicken breasts for this. However, don't worry if you are without a meat mallet - smack it with a rolling pin, the bottom of a heavy skillet or even use a hefty bottle of wine if you must. 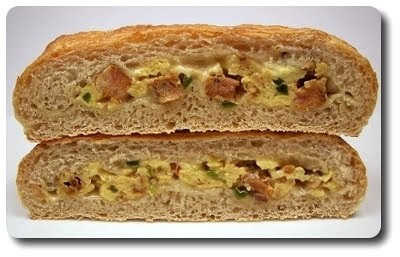 When they have all been pounded out, we took each piece for a swim through a mixture of beaten egg, fresh parsley and Dijon mustard. After the dip in egg, the pieces went into a shallow dish that we filled with crisp panko breadcrumbs. Once they have been coated, I like to set breaded meats like this onto a wire rack and let air dry for a few minutes - I don't know if it really does anything, but it seems to help the crust stay on the meat and not peel off in the skillet. We often bake breaded dishes like this, but this time we pan-fried the paillards until each side was deeply golden. You don't need gobs of oil for this either, just enough to completely coat the bottom of the skillet so there is some left when you turn the pieces over. Hurried out of the skillet and onto the plates, in the same pan we whisked in a mixture of broth and pure sweet maple syrup, along with another dollop of coarse-grained and Dijon mustard. After having a chance to simmer and reduce, we stirred in a nob of chilled butter to give the sauce a lovely sheen and hint of richness. 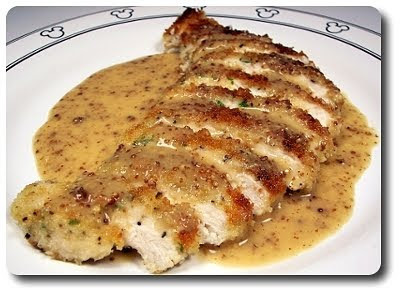 We sliced the crispy chicken before spooning the sauce over, but it is just as nice if you leave them untouched. Because the chicken cooks so quickly, it remains quite tender and moist, which contrasts well to the textural crunch of the light outer breading. If you've never tried using panko before, this would be a fantastic recipe to try it out, showing you just how well the coarse Japanese breadcrumbs work in breading like this. Jeff and I both found the sauce a tad on the sweet side, but using the duo of mustards reinforced the savoriness with a delightful piquant tang. I bet this exact same method would work out well if you replace the chicken with pork! We left on Tuesday for a short trip to the East coast (more on this soon), but we're back home tonight! It may take a day or two to get life back in order, but in the mean time, we thought it would be a good time to work on getting a F.A.Q. post together. Have a question you've always wanted to ask or have to know something specific about us or the site? We'll gather up what we can from the comment section or e-mails (you'll find an e-mail link on the right hand side of the page) and set up a post with answers as time allows. When we made those pot pies a few weeks ago, I was left with a sheet of puff pastry that I tucked away in the freezer as I didn't have a plan for it at the time. 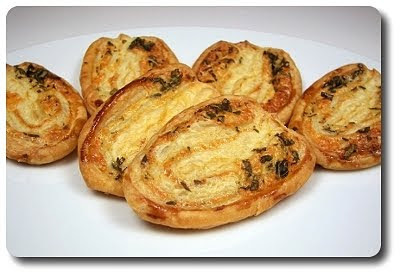 I needed an appetizer recently, one that was either especially speedy or that I could get the work done ahead of time, and when I saw these Herb-Cheese Palmiers called for that lone puff pastry sheet in the freezer, I knew it was fate! Since the pastry was frozen, it needed to be thawed before we could work with it. 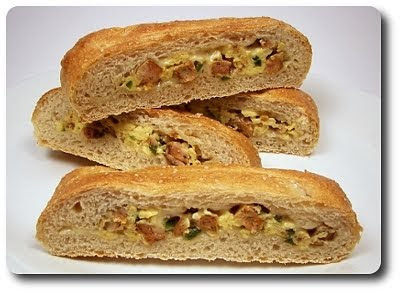 You can do in two ways - either on the counter for a half hour to an hour, or in the refrigerator overnight. I tend to prefer the latter because the sheets tend to thaw more evenly without making it sticky. With a few heavy pushes from a rolling pin, we stretched the pastry to not only even it out, but make for a greater work surface to pile on the filling. Brushed with a restrained glug from a bottle of extra-virgin olive-oil, the pastry was topped with two types of grated cheese - extra-sharp cheddar and nutty Parmesan cheese. Fresh herbs adorned the bed of cheese - use a blend that you particularly enjoy, but we thought the suggested combo of oregano, sage and thyme was an outstanding choice. Even though the cheese brings some salt, you'll want to sprinkle the top with a bit extra to pull all the flavores together. Covered in all of those ingredients, the rectangle was ready to be enclosed somewhat like a three-fold letter, then folded in half once more, lengthwise, to make a tight compact package. Since the pastry has now softened after being out of the ice-box for awhile, it is best to stick it back into the refrigerator to firm back up before you attempt to slice it. Thinly sliced and neatly assembled onto baking sheets, the raw pastry goes back into the refrigerator once last time to ensure the butter is very firm and cold to get the best puff possible. This may seem tedious, but it is one of the best parts about these palmiers! They'll be ready to bake in a half hour, but you can assemble them up to this point and leave them, covered, in the refrigerator for a day or two! This way, when you need them, all you'll have to do is give 'em a quick egg wash and pop them into the oven until they are deeply golden brown. They may look small going in, but as the heat hits the buttery dough, each one puffs up into these sleek, light and incredibly flaky pastries that are impossible to stop at just one. Jeff did make a comment that a hint of heat from either a tiny sprinkling of cayenne or crushed red pepper would be a nice compliment to the sharpness of the cheeses. Jeff had been dropping hints left and right over the past few days that a soup or stew, preferably of the beefy variety, would really hit the spot. I had the weeks' worth of recipes laid out on the counter in the kitchen and when I had left the room for a moment, he decided to stop and gander at my selection to see if I had catered to his request. I did, in fact, have one in mind and I knew he found it when even from the other room I heard his sad groans when he came upon the "8 ounces of sliced mushrooms". I know I talk a fair amount of Jeff's dismay of all things fungi, but really, this is what I have to deal with and I don't want to be the one only suffering! I should have played it up, but I let him know I already had plans to drop the mushrooms and up the amount of protein in this Beef-Barley Soup, which turned his frown into a big grin. You could use a package of already cut stew meat to speed this along if you like, but the market had a killer deal on chuck roast, which I just hand-trimmed and cut into cubes. Because I upped the amount of beef, we decided to brown the beef in a couple of batches, rather than dumping the whole lot in at once. This way, the temperature in the pan wouldn't drop and end up steaming the meat, instead of allowing the cubes sear properly. It takes a few extra minutes, but the developing those caramelized edges make all the difference. To the drippings and crusty bits left behind in the bottom of the pan, we stirred in the vegetables of choice - carrots, celery and onion. Now, if you won't be serving to a mushroom downer, this would be the time to toss in a half pound of sliced 'shrooms too. When those vegetables have softened, exuding some of their moisture to pull up those tasty bits, the beef was added back in, along with beef broth and a bay leaf (which was actually pulled fresh from the tiny Laurel tree Mom gave us earlier in the summer... it has managed to stay alive indoors!). You will need to plan a bit if you opt to make this, because at this point, the pot is covered and simmered for an hour and a half, allowing those tough cubes of meat to turn into tender cubes of beefy love. 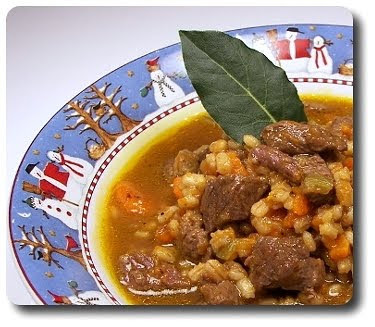 To bulk up this dish into a legitimate one-pot hearty meal, a scant cup of pearl barley is stirred in and left to soften, soaking in the rich juices the beef had been bubbling in. 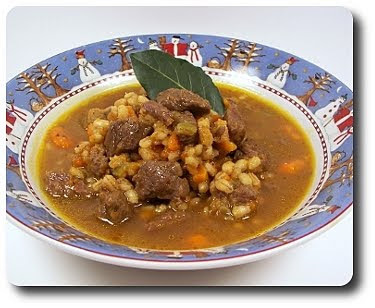 While the soup/stew may not win any beauty awards, this dish was certainly soul-warming, filling and we thought had just the right mix of broth to the beef and grain combo. There were a couple of things that I would think about for next time - because the vegetables simmer for practically two hours, thye do end up being very, very soft. Not a bad thing as they make for a lip-smacking broth, but I think increasing the amount of them in the beginning, taking a couple scoops out before the broth is added and then stirring them back in at the end would add bonus points for texture. Also, we thought a heavy shot or two of dry sherry, added before the beef and broth goes in, would be a pleasant addition, helping to bring a full-bodied note to the finished pot. There are a couple recipes that we made over the holidays that we just didn't get a chance to share and before I completely forget about them, I figured I better get on the ball! 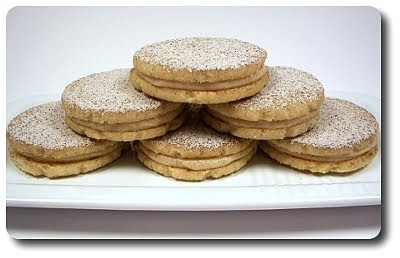 Today we'll get to one of the cookies we made, these dainty Browned Butter Cardamom Cookies. Don't be scared of the "browned butter" part if you've never had the chance to do that before - it's very simple and the development of flavor is definitely worth it. Basically all you are doing is melting butter, then leaving it over the heat long enough to toast the delicate milk solids, turning the butter a rich hazelnut color. You can take it too far though, making the results a tad bitter -you'll know it's ready when the color of the butter begins to darken, the milk solids fall to the bottom of the pan and become toasty specks and you smell an intensely nutty aroma. Once you've gotten the butter taken care of, it needs to cool down before we mix in the rest of the ingredients - to speed up the process, we transferred the liquid gold to another container and stashed it in the refrigerator for a half hour. It doesn't need to solidify, but just come down to room temperature first. Granulated sugar, a single sunny egg yolk, a hearty splash of aromatic vanilla and the ingredient that makes these cookies a little exotic, cardamom, were beaten into the butter to get the cookie dough started. 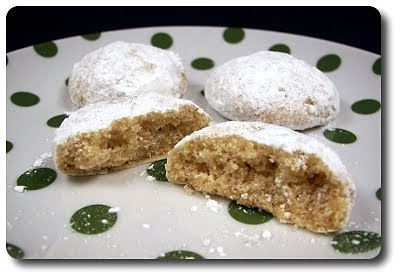 When the flour was added in to complete the mix, the dough was rolled into small balls and baked just until the edges of the cookies began to turn a light golden. You'll want to take them off the baking sheet as soon as possible and let them cool for just a couple minutes before you take them through a ride in a snowstorm. 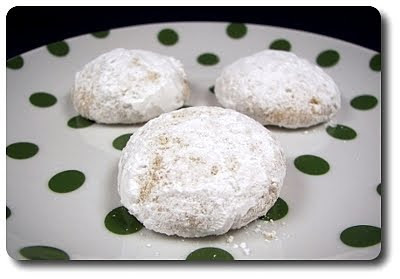 Well, not really, but the warm cookies are tossed around in a bowl of confectioners' sugar - doing this before they have cooled down ensures they get an ample sweet coating. You will need to work gingerly here as the cookies are fairly delicate at this point. The warmth will allow the cookies to absorb most of the coating, which means they need to go for round two in the sugar once they have completely cooled to give them that classic just-dusted appearance. To reinforce the cardamom, we did combine the confectioners' sugar with a big pinch of the spice, but if you're unsure you want an in-your-face cardamom experience, use the lower amount called for in the dough and drop the addition in the coating. The cookies are firm, crisp and a little crumbly, but once they hit your tongue, they begin to melt in your mouth, leaving behind a sweet, nutty flavor that ripples with the unique essence from the cardamom. I know the amount called for doesn't look like a lot, but don't go dumping it in without measuring like you would with, say cinnamon - the spice is pretty powerful and pungent, especially when freshly ground. We are finally getting back into the groove of new Friday Pizza Nights (well, we actually did make pizzas on a couple of those Fridays that we missed, but they were requested repeats from Jeff) and the one we made this evening, Egg and Pepperoni Breakfast Pizza, will make for a rockin' meal tomorrow morning with the leftovers! The eggs will be going onto the pizza pretty much completely cooked, which means we needed to work on the crust before we touched anything else. Because there was going to be ample toppings place on top of our ever-beloved, pantry-staple whole-wheat pizza dough we typically use as our base, we gave the crust a thick rim by flipping a small bit of the dough around the edge onto itself and pressing down firmly once we scooted it onto our handy wooden pizza peel. Because the dough needs to be baked through naked, I do suggest taking a fork and docking the dough to prevent the center from bubbling up, leaving you with a level base to work with. For the egg-y topping, we whisked together eggs, a combination of whole eggs and whites, with a heavy splash of milk and seasoned the mix lightly with salt and fresh ground black pepper. The pepperoni, turkey in this case (you can use regular if you like, turkey just isn't as greasy), was also stirred in, along with a few tablespoons of thinly sliced scallions. Poured into a gently heated skillet kissed with melted butter, the eggs should be cooked until they just begin to firm up, but are still very moist - not runny per se, but realize they will cook a touch more. 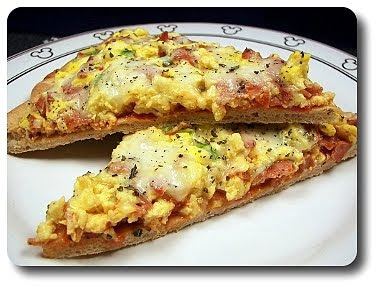 A thin layer of a homemade pizza sauce was smeared over the baked crust just before we arranged the scrambled eggs on top. 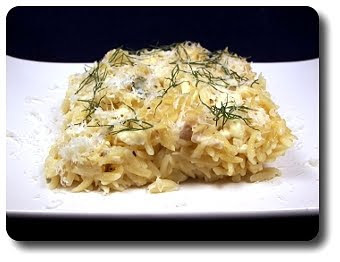 A touch of sharp Asiago cheese was then added, along with plenty of shredded mozzarella cheese for that gooey finish. We didn't have any fresh basil, which would have been a nice contrasting pop of color to toss on after it was baked, but we still wanted that licorice-y note. Thankfully we keep our spice rack well supplied, we were able to pull out a jar of the dried version and sprinkled on a couple pinches. The assembled pizza only needs to go in for a final blast of heat to melt the cheeses and bring the eggs back up to temperature, which took a short three to five minutes. Jeff and I quite liked the pepperoni in this not only because it brought a meaty edge, but it also accented the soft eggs with a token of spice. If you only like your eggs especially wet, do note that the eggs continue to cook slightly and end up fairly firm, but neither of us felt they were too dry or rubbery in the slightest. 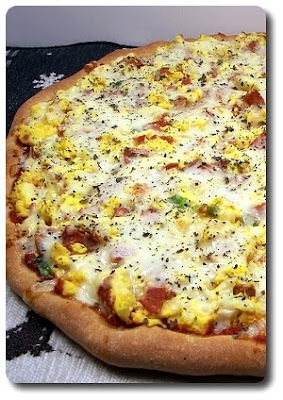 A fun and different pizza indeed and not one ounce of guilt for eating the leftovers for breakfast!. You would think that with us living in Minnesota, we would prepare more dishes that included wild rice as an ingredient. In fact, the last time we used it was in that wicked good Chicken and Ham Wild Rice Soup back in '08. It's not that I don't keep it handy in the pantry, but for whatever reason, I just don't come across many recipes that call for it. That bag we have caught my eye before I sat down to menu plan for the week and after giving myself a small guilt trip for not giving it any attention, I made sure to find a use for it. 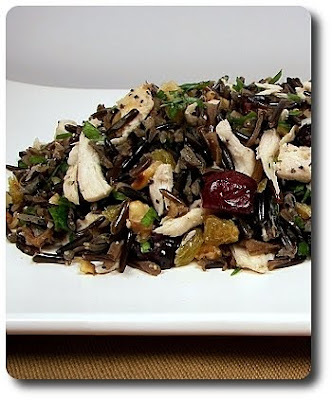 I gravitated to what was intended to be a side dish, but with some protein tossed in, this Wild-Rice Pilaf with Chicken, Cranberries and Pecans became our main tonight. You could simmer the rice in a pan of water to get it cooked, but you'd then be starting with a fairly bland slate. With some simple additions though, you can hijack the rice and give it a running head start! We heated a slick of extra-virgin olive oil to get us going this evening, which we used to soften a couple spoonfuls of finely chopped shallot. When the pieces were translucent and tender, we added the intensely nutty rice and gingerly stirred it around, allowing the seeds (did you know wild rice is not technically a grain, but actually a seed?) contact with the heat to toast briefly. Instead of using water as the liquid, we poured in plenty of savory, gold-tinged chicken stock for the wild rice to drink up. 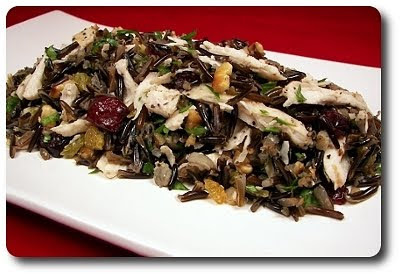 The maturity of the wild rice will determine how long it needs to cook - typically it will be done around 45 to 50 minutes, but sometimes it may need a few extra to soften enough. You'll be looking for the seeds to start bursting open from its black casing to tell you when its about ready. By the time the rice is ready, you may, but not always, have extra cooking liquid in the pot - don't be tempted to cook it until all of the liquid has been absorbed... just drain any any excess. To round out the dish, we stirred in cooked, shredded chicken, crunchy toasted pecans, tangy dried cranberries, golden raisins and for a bit of freshness, chopped parsley. This can be served right away, which is how we had it, but it can also sit around and be just as tasty at room temperature. I found that out as I snuck a few extra spoonfuls when I went to portion the rest of the leftovers. If you wanted to forgo the shredded chicken to make a vegetarian-friendly side, all you would need to do is swap out the chicken stock for a high quality vegetable stock. We went back and forth trying to pick out what we would make for the first Wednesday Treat Day of 2010. I had tossed out a few ideas like a fun cake, peanut butter bar cookies or brownies, but Jeff thought it would probably be a better idea to go a little lighter, at least for the first round. He's probably right (oh and I'm sure I'll hear about that for awhile...), so we decided muffins would be a good compromise. Muffins... got it, but what kind? Since we were looking for a lighter take, we thought raisins, whole-wheat pastry flour and a little bran thrown in for good measure would get us going in the right direction. 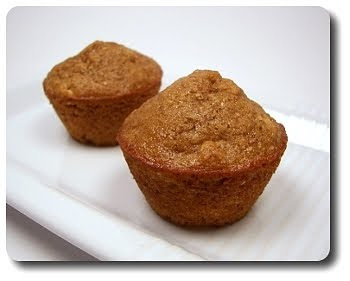 Using those ingredients as a base, we were led to these Miniature Raisin Bran Muffins! To take the edge off the sharp bran and hefty old-fashioned rolled oats these called for, they were combined with the wet ingredients and left to sit for 15 minutes. Not only does this give those two a chance to soften, but it allows some of the liquid to be absorbed so the batter isn't too thin to support the raisins. Often one would just use granulated sugar to sweeten the muffin batter - but these call for a scoop of brown sugar, which lends moisture and richness, while a drizzle of molasses brings a brawny, complex background. Not only does that make them more interesting, but I loved how it stained the muffins with a wonderful dark color. With a combination of all-purpose flour, whole-wheat pastry flour, baking powder and a sprinkling of cinnamon standing in as the dry ingredients, they were combined with the thickened wet base to form the batter. We then folded in a handful of golden raisins, but regular dark raisins would work fine. When you go to fill the miniature muffin tin, go almost to the top of the rim - I just used a small cookie scoop which sped the process up quickly. For a less messy process, you could also pour the batter into a zip-loc bag, snip off the end and squeeze a bit of the batter into each well. Being miniature, these muffins bake in a flash - less than 10 minutes, so don't stray too far once they go into the oven. As soon as you pull them out, let them sit for just a minute or two, then quickly (but carefully as they are hot! 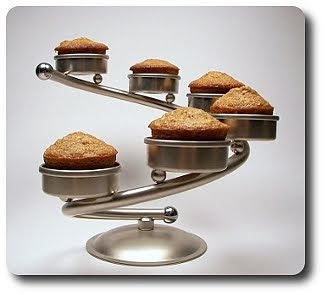 ), turn the muffins out onto a wire rack to finish cooling. If you let them sit in the pan to cool, you'll have two problems - they will tend to stick to the pan and the muffins will steam as they sit, making for a tough crust. 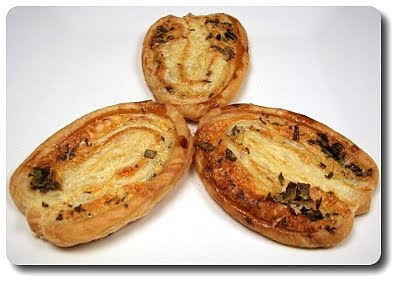 These one or two-bite treats were moist with a wheat-y heartiness to them that was fitting and pleasant without being overwhelming. 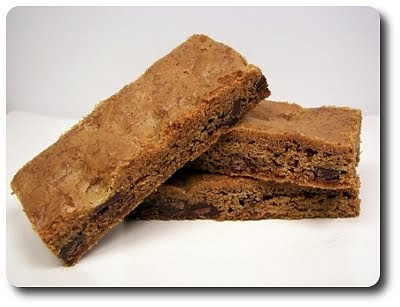 The raisins were a nice touch, adding a bit of texture to the crumb, while also lending another dimension of sweetness. If you don't have a mini baking tin or just enjoy larger muffins, divvy the batter into a standard 12-cup tin and bake them for a few extra minutes. After picking up a couple random acorn squashes at the market this past weekend on impulse, I now needed to figure out what to do with them! 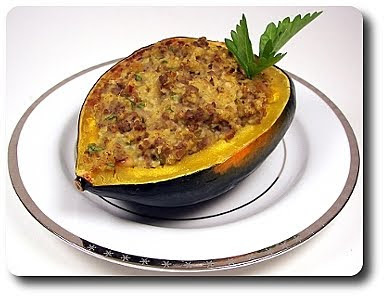 I knew I had a few recipes lingering somewhere in our to-try piles and after spending a few minutes sifting through them, I came across a recipe for Moroccan-Style Stuffed Acorn Squashes. This one stood out mainly because we already had the remaining ingredients called for on hand. You'll need to halve the squashes first to scoop out the seeds and roast them, but it can sometimes be fairly difficult to push a knife safely through. To help ease your knife in, you can stick the whole squash into the microwave and heat for just a few minutes (two or three is usually enough) - this softens the outside just enough to aide in the halving process. While the squashes roast, we used that time to brown a mound of ground sirloin, spiced with a pinch of fragrant cinnamon and fresh grated nutmeg. It may seem unusual to some to add spices typically associated with sweets and baked goods to meat, but because there is just a small amount, they work in adding such a unique complexity without making it taste like dessert. After scooping out the browned crumbles, finely chopped onion made its way in to sweat out and soften. A mess of minced garlic was stirred in and as soon as their pungent aroma lifted from the pot, grains of bulgur wheat went in, followed shortly by enough vegetable broth to moisten the grains. When the fiber-rich bulgur had softened, the browned sirloin was added back in, along with plump golden raisins, fresh parsley and buttery toasted pine nuts. 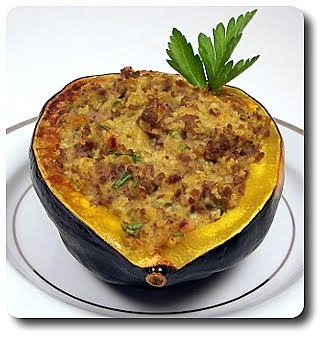 When the squash halves were ready, we let them cool slightly, then scooped out their tender fleshy insides and then folded that into the bulked up beef mixture. Scooped back into the now-empty halves, the squash then went back into the oven to bake for a second time - however, because everything is already cooked, it won't take long to bring the filling back up to temperature and give the tops a bit of color. I found myself quite attracted to this cozy dish, especially with the golden raisins and pine nuts inside, but Jeff wasn't as thrilled. That's not to say he didn't finish his portion, but I could tell he wasn't a fan as it took him much longer to eat than normal. I do admit to knowing that he wasn't a lover of squash already, but I was secretly hoping between the beef and bulgur it would help bring him around. He says it goes back to the softer texture of the squash and its more earthiness that just didn't jive with him, otherwise the rest of the flavors were good. Jeff had been eying the bananas I had sitting off in the corner, letting me know their status each day as their yellow jackets turned dark, almost completely black. See, he likes his bananas just barely ripe, even better if they still have a tinge of green to them. However, to get the most sweet bang for our buck, I let them go as long as possible before using them or tossing the bunch in the freezer for a later date. To him they are mushy, gross and he can't stand looking at or touching them when they go this ripe (he's even had the audacity of trying to throw them out!). He does end up loving their intensity in baked goods though, even if he won't admit it... 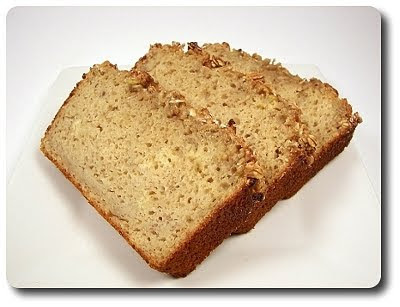 I used a few of those dark bananas this morning to make this Whole-Wheat Banana Bread. 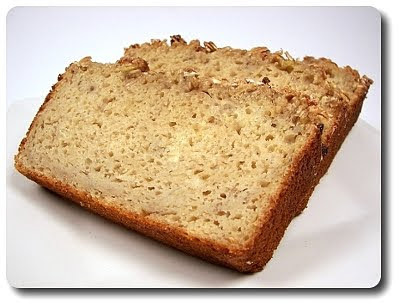 Because this is a quick bread, making the batter is a snap and can be done by hand without hauling out a mixer. 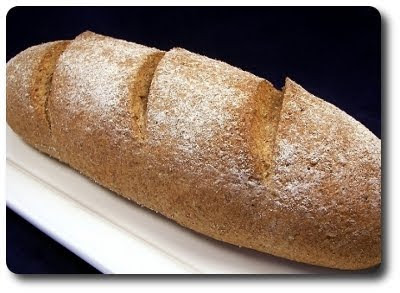 Using a combination of white-whole wheat flour (whole-wheat pastry or even regular whole-wheat flour would be fine) and all-purpose as the dry ingredients, we also mixed the brown sugar called for right in, along with the leavening and salt. To take this bread in a healthier direction, instead of using a lot of fat for moisture and tenderness, the recipe called for replacing that with tangy buttermilk and just a single tablespoon of canola oil. Mashed bananas and a couple eggs, with a splash of vanilla for good measure, round out the wet ingredients, creating a thick batter when combined with the flour mixture. If you love a nutty crunch in your banana bread, don't be afraid to fold in a half-cup handful of toasted walnuts or pecans too. 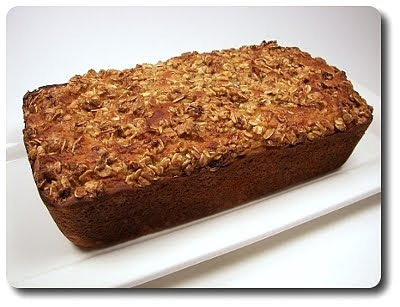 Once scooped into the pan, we topped this off with an intriguing streusel-like concoction before going into the oven. With just three ingredients, this mixture was prepared by stirring together old-fashion rolled oats, a few spoonfuls of brown sugar and yep, more banana! You won't want one of those extra-squishy ripe banana for this though - use a firmer one so most of the pieces retain some shape. As soon as the cake tests done, preferably with a few moist crumbs attached to the toothpick or skewer you use, let in rest in the pan for about ten minutes before turning it out to cool completely. I'll start off by saying that because there wasn't a lot of added fat, you can imagine that this bread is on the denser side, but neither of us thought the texture was gummy or like a heavy brick as some low-fat baked goods can become. It was still plenty moist and both of us commented on how well the tang from the buttermilk paired with the sweetness of the banana. The oat-y nuggets on top was a nice surprise, adding a bit of crunchy and extra banana flavor. Would I make it again? I think so, but I would probably think about reducing the buttermilk by a quarter cup and replacing that with either melted butter or canola oil to see if that would improve upon the texture.